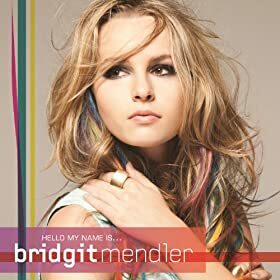 I glimpsed Bridgit Mendler on Amazon's new releases list and couldn't help but wonder where I've seen this girl before. Truthfully, nowhere, because I haven't watched any of her movies or television shows. In my defense, she just has one of those faces. But to fans of the newly debut pop singer, she starred in the popular Wizards of Waverly Place and now Good Luck Charlie. Fortunately, this is a review on her debut album and not on her acting career because I have never watched either. Ready or Not is in fact a sweet package. A not so bubblegum pop record with fresh and catchy beats. Bridgit's efforts can be heard throughout the album, making her debut an acceptable one. The funky-pop lead single sets the album off on a fun vibe. Bridgit sings playfully throughout the track and diminishes it from being too intense. Shame on me for not realizing I’d heard this song back in August, and for not turning to Google to learn more about the singer because I actually like this song and the positive atmosphere it creates around me every time I listen to it. The music video is cute, entertaining, and simple. It may not have lived out the lyrics but it was worth filming as much as it is worth watching. Forgot to Laugh had me giggling a bit. I enjoyed the realistic elements utilized in the lyrics. The track is well produced with a grungy electric guitar blending with a fierce bass and hard-hitting drums, and Mendler’s sassy vocals sound convincing the more the track takes off. The song’s ingenious verbiage is quite appealing, demonstrating the singer’s ability to incorporate humor in her songwriting and like the first track, pushes tension out the door. That intro in Top of the World attracted me to the song. It sounded like a dramatic melody straight out of a classic black and white film with captions instead of voices. Its transition into a more poppy and dance beat was a tasty surprise. This is a satisfactory song but Bridgit’s high pitches during the chorus sounded a bit painful to my ears. Almost like that of a seven year old. Because of that I’m unsure as to whether or not I’ll listen a second time. Quite ironic to hear a track called Hurricane when we’re currently experiencing one of mother nature’s conception of the said thing. And interestingly enough, I love this song. The acoustic opener caught me instantly and I’m addicted to her “oh, oh, oh…” The singer’s play on natural disasters as metaphors for the way she feels about her love interest once again showcases how witty she is as an artist. The fast paced pop rock driven track is both catchy and substantial. City Lights takes on a different vibe from the previous four. The country influenced music combines urban pop, rock, and a little acoustic soul along the way. Also, the addition of strings create emphasis on the song’s purpose. City Lights is the first so far that doesn’t have a relationship concept, but focuses more on chasing your dreams and taking on challenges. Bridgit backs up into the relationship theme with the soulful rock ballad All I See is Gold. The track remains subtle yet fairytale like with sensual piano melodies and haunting backing harmonies; the drums are tamed with only the use of dramatic one drop toms throughout. Mendler’s vocals are heard clearer than ever being the only focal point of the track with most instruments set aside. Her emotionally charged singing reiterates the meaning behind the deep words. Old school influenced The Fall Song has a mid-tempo beat that’s soothing and refreshing. The track’s reference to the actual season in comparison to the singer’s feelings is just smart and well thought of. Who knew someone could come up with a song about falling for another and describe it so well to the effects of Autumn? That’s just crafty artistry of a romanticist. When Love Will Tell Us Where To Go started playing I felt like I was swept back into old western during one of those showdown at high-noon. That feeling isn’t exactly the meaning behind the words but I just had to throw that out there. Its actually a song about letting love lead the way and trusting your heart. Its a beautiful and groovy urban pop song with the potential to be a standalone promotional single for the album. This track might not be a dance number but it sure has an interesting vibe that sparks interest. Blonde reiterates the fun side of the record, playing on the stigma associated with the word, that blonde’s are dumb. Sounds like Bridgit’s emphasizing on the silly misconception society has about ladies with that hair color. The pace has remained mid-tempo or slow since City Lights ended and I’m kind of anticipating a more upbeat session by now. Blonde is a silly laid back track but its time for a change in pace and a little more depth. Rocks at My Window couldn’t come soon enough. The reggae influenced track flows through my veins and gets my feet stomping. While the lyrics are a bit lonely, the beat is energetic. And that bridge is the highlight of the song that makes me feel like dancing in the middle of the street. This is my absolute favorite song on the album. 5:15 is just tantalizing. This is yet another mid-tempo but quite an exceptional number. Bridgit’s voice is as sweet as honey; her vocals compliment the passion filled words perfectly. I can’t stress enough on how good these songs are written. The song’s about waiting until the last minute just to see the one she loves before leaving. Bridgit’s come to the realization that every single second matters. While she’s eager for what will happen I feel every essence of that in the instruments, all carefully composed to convey her emotions. The sultry ballad Hold on For Dear Love held on to my heart the moment those keys started flowing. Bridgit’s vocal ranges are well balanced, lovely, and believable. In her own way, she’s made an impression with this track. This is a suitable end for the regular album, but leaves you antsy for more. While I love music boxes and lullabies, the high pitched tune throughout We’re Dancing irritated me. Otherwise, it’s an entertaining song and big switch from what I’ve been hearing all along. This is an electropop dance number that’s great for the clubs and fun for your home stereos. I loved the strings in the bridge but I felt like it was just thrown in there and taken right out so quickly. Had it been included in the chorus from start it would’ve sounded so much nicer. Overall, it’s an okay song with some minor issues. Postcard continues the upbeat session. Unlike its predecessor, this track is a bit more put together in regards to its musical composition. The claps and echoed whistling effects are tolerable additions, and the beat on a whole is addictive. Mendler’s breathy tones in some parts and vibrancy in others is well coordinated. The song is a rather creative arrangement in all aspects. The album concludes on a wonderful note. Quicksand is the most heartfelt ballad on the deluxe version, and on the entire record. Its simple where the amount of instruments are used, and convincing where her vocals are concerned. Mendler is taken over by so much love that it overflows in the lyrics. From start to finish I connected with her emotions and even had goose bumps while listening. I was captivated by the piano and heavenly strings. The drums at the end of the track worked well and stayed in the right place. It was a brilliant idea to keep the track lightweight and beautiful. Hello My Name is… is fresh, unrecycled, and likable. Its an enjoyable album with facetious and meaningful romantic lyrics uncommon in music these days. As an actress branching out into music, Bridgit delivered a pretty decent first attempt and I look forward to something much stronger next time around. * This review does not reflect the opinion of EY on a whole. Fun album! Bridgit is quite a talented singer, and her songs are very catchy. Although the first time I heard the song “blonde” I was slightly annoyed just because it’s a stereotype that gets on my nerves. But OF COURSE she is simply just making fun of how ridiculous the stereotype is. That was obviously the point. She’s being satirical about the whole thing. However, it seems like (from what I’ve noticed) the stigma is more against women with bleached blonde hair, rather than natural ones. And the stereotype in many ways is (fortunately) dying out, so to speak. It has been for quite a long time it seems like. Most people don’t really make fun of it anymore, and don’t care. Which is good. And I think most people are smart and mature enough not to buy into it. Overall, pretty good debut album! I hope she goes far!!! Wow! Glad to see a disney artist debut and actually do well! This girl has talent and seems super down to earth. Congrats on her debut! I’ve never been into disney ppl calling themselves singers but Demi and this chick don’t sound half bad. However, its hard to take them serious cause I just see kiddies. Good review, Kai. Her voice is really unique with that country feel.